We need state police to tackle insecurity – VP, Yemi Osinbajo – Royal Times of Nigeria. Vice President Yemi Osinbajo on Thursday called for the establishment of state police to effectively tackle the various security challenges facing the country. 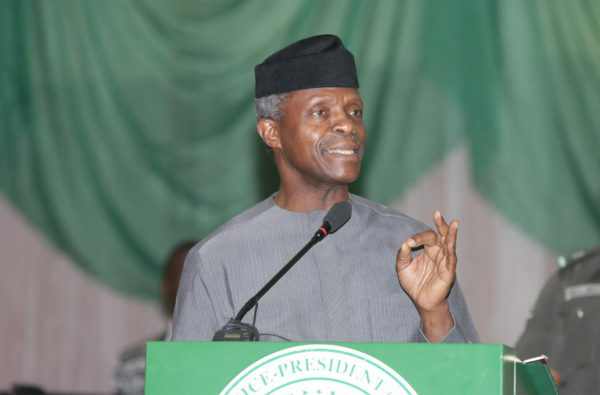 Osinbajo, who spoke at the opening ceremony of the on-going National Security Summit in Abuja, organised by the Senate, assured that the Federal Government will not forcefully take land from the states for the purpose of establishing cattle ranches or grazing areas. Osinbajo said the Nigeria Police with the current centralised structure is too defective to be useful in combating worsening security challenges in the country. He further stated that in the interim, the number of police personnel must be increased reasonably to be able to match the frightening unfolding insecurity in the country, and warned Nigerians not to allow the present security situation to assume a religious dimension. He said, “The nature of our security challenges is complex and known. Securing Nigeria’s over 900,000 sq km and its 180 million people requires far more men and material than we have at the moment. It also requires a continuous reengineering of our security architecture and strategy. This has to be a dynamic process. For a country of our size to meet the one policeman to 400 persons prescribed by the United Nations (UN) would require triple our current police force; far more funding of the police force and far more funding of our military and other security agencies”. “We cannot realistically police a country of the size of Nigeria centrally from Abuja. State police and other community policing methods are clearly the way to go. “We must intensify existing collaboration with our neighbours in the Chad Basin by strengthening security especially at border communities to prevent the movement of small arms and disarming armed pastoralists and other armed bandits who go through our borders day after day. We must avoid the danger of allowing this crisis to degenerate into religious or ethnic conflict”.